The Spring Show Program includes performance information, Tributes, and Business Advertisements. A Tribute usually includes photos and words of encouragement honoring your daughter and her friends. Funds from Tributes and Business Ad sales will help pay for the program, costumes, choreography, and staging the show. Tributes may be sold to friends and family too. You may purchase your ad online by clicking one of the buttons below. See below for full instructions BEFORE purchasing your ad. Note that the deadline for submitting ALL photos, artwork and text to Stephanie Dickinson is MARCH 9th! Tributes and Business Ads submitted should be “program-ready” or “computer-ready”. 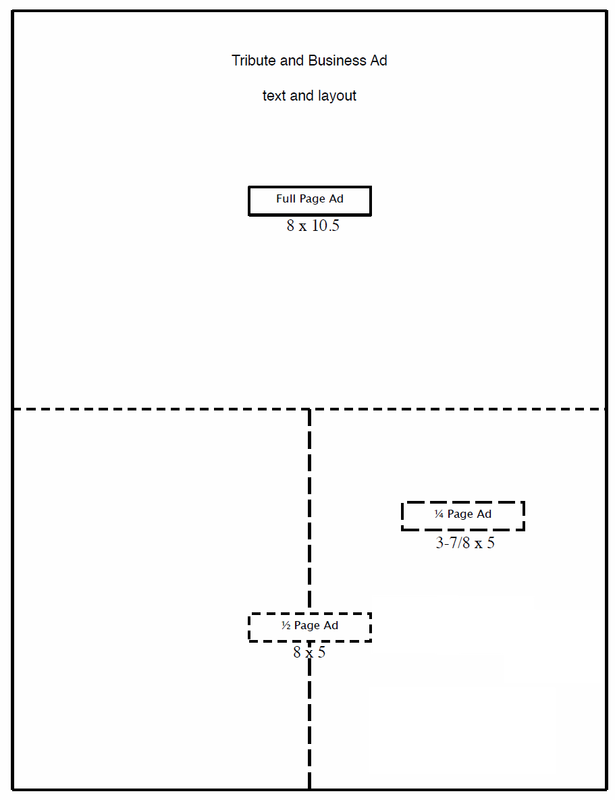 Program-ready means that you will supply the finished layout. This includes artwork, photos & text all on one document. Completed artwork may be sent by email in a full JPEG file format (at least 300 dpi) or in a high-resolution PDF format ready to go as is. Do not make smaller for faster emailing. Computer-ready means that you submit photos, text, & text layout and design in a digital format and your tribute/ad will be designed for you. FULL PAGE (8" x 10.5"): up to 8 photos accepted. HALF PAGE (8" x 5"): up to 4 photos accepted. QUARTER PAGE (3 7/8" x 5"): up to 2 photos accepted. Please note: While color photos are accepted, the program will be printed in black and white. Unless you purchase a color ad, your artwork and photos will be in black & white.